Last night I was contemplating which book to pick up out of my three current reads (“The Rosie Project” by Graeme Simsion, “My True Love Gave To Me” edited by Stephanie Perkins or “A Clash Of Kings” by George R.R. Martin, but none of them really spoke to me at that precise minute. 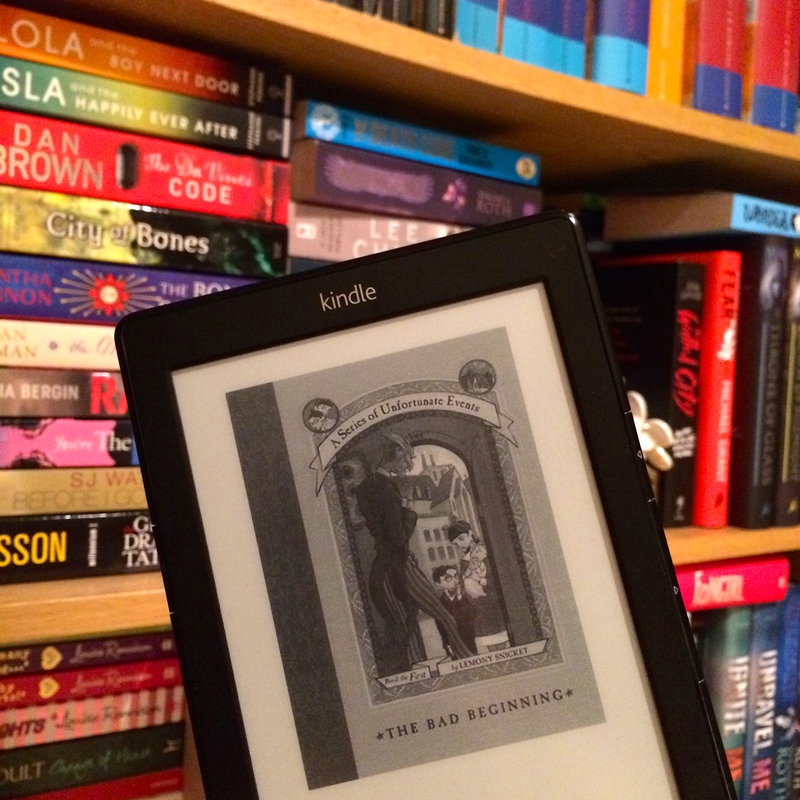 On the spur of the moment, I decided to switch on my Kindle, something I’ve only done a couple of times in the last six months, and that led me to decide to re-read Lemony Snicket’s “A Series of Unfortunate Events: The Bad Beginning”. When I was eight or nine I read the first three books in this series, but didn’t really get into it in a big way, but as it’s a quick read, and it fulfilled #33 A book from your childhood, I decided to pick it up (and subsequently whizz through it). “Unfortunate is right. In my first childhood revisited novel of 2015, Lemony Snicket’s world hasn’t stood the test of time, at least with me. I read the first three books when I was younger, but didn’t get into them beyond that, and now looking back I can understand why. I’m not sure when I’ll read the other *twelve – yes twelve* books in this series. I have the next two loaded onto my Kindle, so I may well pick them up in the future. Out of the three books I’ve read so far in 2015, it is my least favourite, so the remaining books are not high on my TBR list. Regardless, I have to say, reading on my Kindle again was an enjoyable experience, and I do believe that I read more when I’m less concerned with pages numbers, and when the end of the chapter is, so credit where credit’s due Amazon. You made a great product there! Three down, forty-seven to go.